In my opinion, EightBit Penny Boards are the best Penny Boards for very little money. If you don’t want to spend all your money on buying an expensive Penny Australia Penny Board, you are well served with a EightBit Penny Board. EightBit says about itself: “Our story is a simple one. EightBit Toys wanted to create awesome, affordable toys and so we did just that“. And they nailed it with this description. They are a small brand but they are expanding and they are becoming well known. The quality is – like many customers on the Internet confirm – very good for the little price. They have retained their mentality of providing cheap toys. Both, 22″ Penny Boards and 27″ Penny Boards of EightBit are very well-made. The quality is quiet as good as the quality of Ridge. These boards are identical in each of its dimensions as the original by Penny Australia. While riding their Penny Boards you won’t notice great differences to riding Penny Australia’s Penny Boards. The smaller 22″ Penny Board of EightBit starts at only $33.99 and the larger 27″ Nickel at even just $42.99! Compared to alle the other brands this is really cheap! 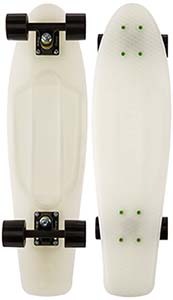 Penny Australia Penny Boards cost at least $80 and the 27″ Nickel starts at about $95! That’s a huge difference. The Penny Boards of EightBit cost less than the half. The quality ist just a bit worse (in comparison to the twice as expensive ones of Penny Australia) but is still really good. In practise the Boards of EightBit can keep up with the Boards of Ridge and Penny Australia. You’ll get a great cruiser for very little money, so I can recommend it to anyone who want’s a Penny Board for little money. Their Boards go nicely and last a long time, also. For these few dollars you won’t get a Penny Board as good as those of EightBit! By the way, a Penny Board is a great gift idea as birthday present or as Christmas present.